SEO may sound like a scary acronym, but it's actually immensely beneficial. SEO will allow you to connect with those searching for your product or service and help turn them into customers. At River Stone we offer our expertise to help your business come up higher on search engine results. We offer two packages to optimize the search results for your site and one Google Adwords package for accelerated results. We take your site and optimize it for the highest possible ranking on Google based on the product or service you are selling. If your business is new, we look at strategies to compete quickly with your competitors. Rankings for page 1 on google for targeted terms. 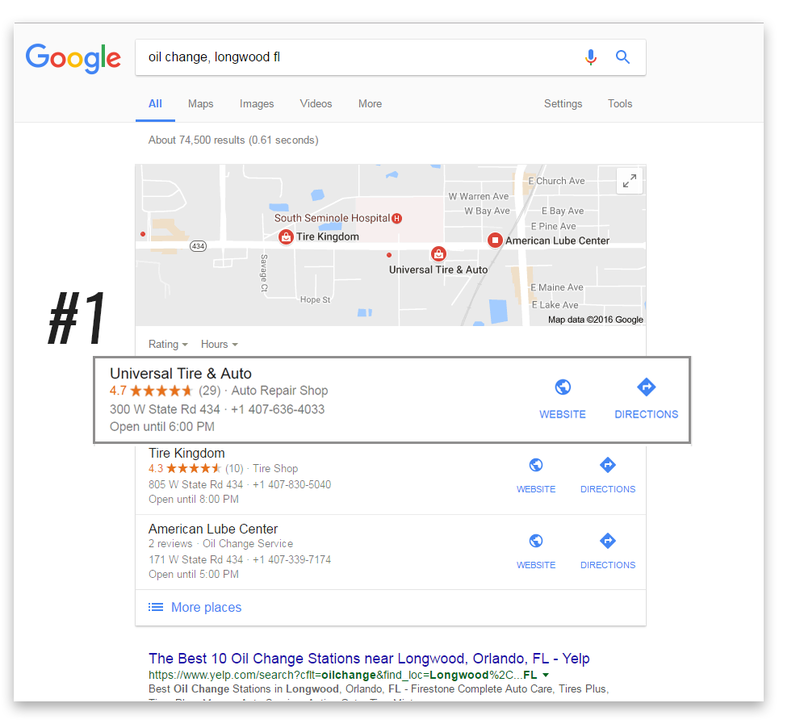 Actual SEO work done for a client (Universal Tire & Auto). Ranking for 3 targeted search terms over 1 year. Client now occupies #1 spot on all three terms, as well as #2, and in most cases #3 for all targeted search terms. That's a huge gain! Same client from above, showing #1 spot on google maps listing for their most important term! Want an immediate boost? Ask about our Adwords work. "AdWords (Google AdWords) is an advertising service by Google for businesses wanting to display ads on Google and its advertising network. The AdWords program enables businesses to set a budget for advertising and only pay when people click the ads. The ad service is largely focused on keywords." Price is determined by size and budget of your adwords campaign spend with Google.